The intersection of education and religion raises complex questions and provokes heated—sometimes fraught—debates. Fundamentally, what is the role of religious education in national curricula? And how especially does religious education work in countries that seek explicitly to separate church from state? What is the relationship between research and classroom practice? And what of religious education in non-school settings? What place should so-called faith schools (such as Brooklyn’s Khalil Gibran International Academy) have in modern plural societies? And, more broadly, how far should publicly funded education officials seek to accommodate the views and feelings of religious communities? This new four-volume Routledge collection addresses these and other controversies. Edited by two leading scholars, Education and Religion meets the need for an authoritative reference work to codify and make sense of the field’s burgeoning literature. The editors have drawn on the most important and influential research from a broad range of countries and perspectives to create a one-stop ‘mini library’. 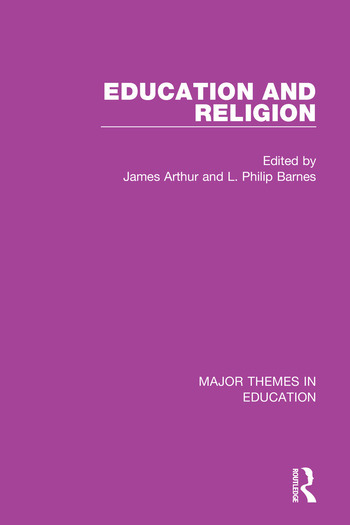 With comprehensive introductions to each volume, newly written by the editors, Education and Religion is an essential addition to Routledge’s Major Themes in Education series. It is destined to be valued by educationalists and scholars working in related areas as a vital reference and research tool. 1. B. Mitchell, Religious Education, Oxford Review of Education, 1980, 6, 2, 133-139. 2. John Haldane, ‘Religious Education in a Pluralist Society: A Philosophical Examination’, British Journal of Educational Studies, 1986, 34, 2, 161-181. 4. Warren A. Nord, ‘Does God Make a Difference? Taking Religion Seriously in Our Schools and Universities: An Excerpt’, Religion & Education, 2011, 38, 1, 3-23. 5. Mary M. Earl, ‘Modernity, Ethics and Religious Education in Contemporary Britain’, Journal of Beliefs and Values, 31, 3, 2010, 271-282. 6. Paul H. Hirst, ‘Education, Catechesis and the Church School’, British Journal of Religious Education, 1981, 3, 3, 85-93. 7. Elmer John Thiessen, ‘A Defense Of A Distinctively Christian Curriculum’, Religious Education: The Official Journal of the Religious Education Association, 1985, 80, 1, 37-50. 8. John M. Hull, ‘Christian Theology and Educational Theory: Can There Be Connections?’, British Journal of Educational Studies, 1976, 24, 2, 127-143. 9. Lieven Boeve, ‘Religious Education in a Post-Secular and Post-Christian Context’, Journal of Beliefs & Values: Studies in Religion & Education, 33, 2, 2012, 143-156. 10. T. Puolimatka and K. Tirri, ‘Religious Education in Finland: Promoting Intelligent Belief?’, British Journal of Religious Education, 2006, 23, 1, 38-44. 11. Brian V. Hill, ‘Will and Should the Religious Studies Appropriate to Schools in a Pluralistic Society Foster Religious Relativism?’, British Journal of Religious Education, 1990, 12, 3, 126-136. 12. B. Watson, ‘The Need for Responsible Religious Education in the Light of the "Value Free" Society’, in M. Felderhof and P. Thompson (eds), Teaching Virtue: The Contribution of Religious Education (London: Bloomsbury, 2014), pp. 29-41. 13. Michael Grimmitt, ‘Religious Education and the Ideology of Pluralism’, British Journal of Religious Education, 1994, 16, 3, 133-147. 14. Wanda Alberts, ‘The Academic Study of Religions and Integrative Religious Education in Europe’, British Journal of Religious Education, 2010, 32, 3, 275-290. 15. P. Schreiner, ‘Different Approaches – Common Aims? Current Developments in Religious Education in Europe, 2011, Extracts from a paper delivered in Oslo, November 2001. 16. Jacomijn C. van der Kooij, Doret J. de Ruyter & Siebren Miedema, ‘Worldview: The Meaning of the Concept and the Impact on Religious Education’, Religious Education: The Official Journal of the Religious Education Association, 2013, 108, 2, 210-228. 17. S. Miedema, ‘Educating for Religious Citizenship: Religious Education as Identity Formation’, in M. de Souza, K. Engebretson, G. Durka, R. Jackson and A. McGrady (eds), International Handbook of the Religious, Moral and Spiritual Dimensions in Education, Vol. I (Dordrecht: Springer, 2006), pp. 967-976. 18. Perry L. Glanzer, ‘Taking the Tournament of Worldviews Seriously in Education: Why Teaching about Religion Is Not Enough’, Religion & Education, 2004, 31, 1, 1-19. 19. G. Moran, ‘Understanding Religion and being Religious’, Professional Approaches for Christian Educators, 1991, 21, 256-260. 20. Gabriel Moran, ‘Religious Education and International Understanding’, in D. Bates, G. Durka and F. Schweitzer (eds), Education, Religion and Society: Essays in honour of John M. Hull (London: Routledge, 2006), 38-48. 22. Michael Grimmitt, ‘When is ‘Commitment’ a Problem in Religious Education?’, British Journal of Educational Studies, 1981, 29, 1, 42-53. 23. Michael Grimmitt, ‘Religious Education and Value Assumptions’, British Journal of Religious Education, 1987, 9, 3, 160-170. 24. Jeff Astley, ‘The Place of Understanding in Christian Education and Education about Christianity’, British Journal of Religious Education, 1994, 16, 2, 90-101. 25. John I'Anson, ‘RE: Pedagogy – after Neutrality’, British Journal of Religious Education, 2010, 32, 2, 105-118. 26. K. Williams, ‘Religious and Educational Policy in France’, in M. de Souza, K. Engebretson, G. Durka, R. Jackson and A. McGrady (eds), International Handbook of the Religious, Moral and Spiritual Dimensions in Education, Vol. II (Dordrecht: Springer, 2006), pp. 1031-1038. 27. Diane L. Moore, ‘Overcoming Religious Illiteracy: Expanding the Boundaries of Religious Education’, Religious Education: The Official Journal of the Religious Education Association, 2014, 109, 4, pp. 379-389. 28. I. Yob, ‘Religious Education Through the Language of Religion’, in M. Felderhof, P. Thompson & D. Torevell (eds), Inspiring Faith Schools: Studies in Religious Education (Aldershot: Ashgate, 2007), pp. 151-162. 29. Graeme Smith and Susannah Smith, ‘From Values to Virtues: an Investigation into the Ethical Content of English Primary School Assemblies’, British Journal of Religious Education, 2013, 35, 1, 5-19. 30. M. Grimmit, ‘Contemporary Pedagogies of Religious Education: What Are They?’, in M. Grimmit (ed. ), Pedagogies of Religious Education (Great Wakering: McCrimmons, 2000), pp. 24-52. 31. Andrew Wright, ‘Critical Realism as a Tool for the Interpretation of Cultural Diversity in Liberal Religious Education’, in M. de Souza, G. Durka, K. Engebretson, R. Jackson , A. McGrady (eds), International Handbook of the Religious, Moral and Spiritual Dimensions in Education (Dordrecht: Springer, 2006), pp. 333-347. 32. R. Jackson, ‘Understanding Religious Diversity in a Plural World: The Interpretive Approach’, in M. de Souza, G. Durka, K. Engebretson, R. Jackson , A. McGrady (eds), International Handbook of the Religious, Moral and Spiritual Dimensions in Education (Dordrecht: Springer, 2006), pp. 399-414. 33. E. Hella and A. Wright, ‘Learning ‘about’ and ‘from’ religion: phenomenography, the Variation Theory of Learning and religious education in Finland and the UK’, British Journal of Religious Education, 31, 1, 53-64. 34. Manfred Pirner, ‘The Media Culture Approach to Religious Education. An Outline with a Focus on Interreligious Learning’, in S. Miedema, W. Meijer and A. Lanser-van der Velde (eds), Religious Education in a World of Religious Diversity (Münster/Berlin/New York/Munich: Waxmann, 2009) pp. 149-164. 35. Carolyn Evans, ‘Religious Education in Public Schools: An International Human Rights Perspective’, Human Rights Law Review, 2008, 8, 3, 449-473. 36. William K. Kay and D. Linnet Smith, ‘Religious Terms and Attitudes in the Classroom (Part 1)’, British Journal of Religious Education, 2006, 22, 2, 81-90. 37. Richard Michael Rymarz, ‘Direct Instruction as a Pedagogical Tool in Religious Education’, British Journal of Religious Education, 2013, 35, 3, 326-341. 38. Lawrence Kohlberg, ‘Education, Moral Development and Faith’, Journal of Moral Education, 1974, 4, 1, 5-16. 39. Harry Fernhout, ‘Moral Education as Grounded in Faith’, Journal of Moral Education, 1989, 18, 3, 186-198. 40. Gabriel Moran, ‘Is Religious Education Moral?’, in Religious Education as a Second Language (Alabama, Religious Education Press, 1989), pp. 165-190. 41. Stefan Altmeyer, ‘Exploring the Unknown: the Language use of German RE-Students Writing Texts about God’, British Journal of Religious Education, 2014. 42. Helmut Reich, ‘Indifference of Pupils to Religion: Can Anything Be Done About It?’, British Journal of Religious Education, 1997, 20, 1, 14-27. 43. Friedrich Schweitzer, ‘Adolescents as Theologians: A New Approach in Christian Education and Youth Ministry’, Religious Education, 2014, 109, 2, 184-200. 44. F. Schweitzer, ‘Religious Individualization: New Challenges to Education for Tolerance’, British Journal of Religious Studies, 2006, 29, 1, 89-100. 45. Robert Jackson, ‘Should the State Fund Faith Based Schools? A Review of the Arguments’, British Journal of Religious Education, 2003, 25, 2, 89-102. 46. Philip Barnes, ‘The Misrepresentation Of Religion In Modern British (Religious) Education’, British Journal of Educational Studies, 2006, 54, 4, 395-411. 47. Robert Jackson, ‘Religious Education's Representation of ‘Religions’ and ‘Cultures‘’, British Journal of Educational Studies, 1995, 43, 3, 272-289. 48. Wendy Ball and Barry Troyna, ‘Resistance, Rights and Rituals: Denominational Schools and Multicultural Education’, Journal of Education Policy, 1987, 2, 1, 15-25. 49. Leslie J. Francis and Andrew Village, ‘Church Schools Preparing Adolescents for Living in a Religiously Diverse Society: An Empirical Enquiry in England and Wales’, Religious Education: The Official Journal of the Religious Education Association, 2014, 109, 3, 264-283. 50. Neil Burtonwood, ‘Political Philosophy and the Lessons for Faith-based Schools’, Educational Studies, 2002, 28, 3, 239-252. 51. Alan Dagovitz, ‘When Choice Does Not Matter: Political Liberalism, Religion and the Faith School Debate’, Journal of Philosophy of Education, 2004, 38, 2, 165-180. 52. Carolyn King, ‘Faith Schools in Pluralistic Britain: Debate, Discussion, and Considerations’, Journal of Contemporary Religion, 2010, 25, 2, 281-299. 53. Gerald Grace, ‘Educational Studies and Faith-Based Schooling: Moving From Prejudice To Evidence-Based Argument, British Journal of Educational Studies, 2003, 51, 2, 149-167. 54. Emile Lester and Patrick S. Roberts, ‘How Teaching World Religions Brought a Truce to the Culture Wars in Modesto, California’, British Journal of Religious Education, 2009, 31, 3. 55. Mark Halstead, ‘Muslim Perspectives on the Teaching of Christianity in British Schools’, British Journal of Religious Education, 1992, 15, 1, 43-54. 56. Geir Skeie, ‘Plurality and Pluralism: A Challenge for Religious Education’, British Journal of Religious Education, 1995, 17, 2, 84-91. 57. S. Altmeyer, ‘Competences in Inter-religious Learning’, in K. Engebretson, M. de Souza, G. Durka and L. Gearson, International Handbook of Inter-religious Education (Dordrecht: Springer, 2010), pp. 627-640. 58. C. Erricker, ‘If you don’t know the Difference you are Living with, how can you Learn to Live with It? Taking Difference Seriously in Spiritual and Religious Education’, International Journal of Children’s Spirituality, 2006, 11, 1, 137-150. 59. Olof Franck, ‘Critical Religious Education: Highlighting Religious Truth-Claims in non-Confessional Educational Contexts’, British Journal of Religious Education, 2014. 60. Catherine Byrne, ‘Ideologies of Religion and Diversity in Australian Public Schools’, Multicultural Perspectives, 2012, 14, 4, 201-207. 61. Martin Ubani, ‘Threats and Solutions: Multiculturalism, Religion and Educational Policy’, Intercultural Education, 2013, 24, 3, 195-210. 62. Philip Barnes, ‘Enlightenment’s Wake: Religion and Education at the Close of the Modern Age’, in K. Engebretson, M. de Souza, G. Durka and L. Gearson, International Handbook of Inter-religious Education (Dordrecht: Springer, 2010), pp. 25-40. 63. E. J. Thiessen, ‘Indoctrination and Religious Education’, Interchange, 15, 3, 27-43. 64. McLaughlin, ‘Parental Rights and the Religious Upbringing of Children’, Journal of Philosophical Education, 1984, 18, 1, 75-83. 65. J. E. Watson, ‘Post-Secular Schooling: Freedom through Faith or Diversity in Community’, Cambridge Journal of Education, 2013, 43, 2, 147-162. 66. L. S. Underkuffler, ‘Public Funding for Religious Schools: Difficulties and Dangers in a Pluralistic Society’, Oxford Review of Education, 2001, 27, 4, 577-592. 67. F. Schweitzer, ‘Children’s Rights to Religion and Spirituality: Legal, Education and Practical Perspectives’, British Journal of Religious Education, 2005, 27, 2, 103-113. 68. J. Arthur and M. Holdsworth, ‘The European Court of Human Rights’, Secular Education and Public Schooling, British Journal of Educational Studies, 2012, 60, 2, 129-149. 69. L. Gearon, ‘European Religious Education And European Civil Religion’, British Journal of Educational Studies, 2012, 60, 2, 151-169. 70. A. Wright, ‘Religious education, religious literacy and democratic citizenship’, in L. J. Francis, J. Astley and M. Robbbins (eds), The Fourth R for the Third Millennium: Education in Religion and Values for the Global Future (Dublin: Linisfarne, 2001), pp. 201-219. 71. Janet Orchard, ‘Does Religious Education Promote Good Community Relations?’, Journal of Beliefs & Values, 2015, 36, 1, 40-53. 72. L. J. Francis, ‘The Logic of Education, Theology and the Church School’, Oxford Review of Education, 1983, 9, 2, 147-162. 73. J. White, ‘Should Religious Education be a Compulsory School Subject?’, British Journal of Religious Education, 2004, 26, 2, 151-164. 74. A. Wright, ‘The Justification of Compulsory Religious Education: A Response to Professor White’, British Journal of Religious Education, 26, 2, 165-174. 75. L. P. Barnes, ‘Ninian Smart and the Phenomenological Approach to Religious Education’, Religion, 2000, 30, 4, 315-332. 76. L. P. Barnes, ‘The Representation of Religion in Education: A Critique of John Hull’s Interpretation of Religionism and Religious Intolerance’, International Journal of Education and Religion, 2002, 3, 2, 97-116. 77. M .C. Felderhof, ‘RE: Religions, Equality and Curriculum Time’, Journal of Beliefs and Values: Studies in Religion and Education, 2005, 26, 2, 201-214. 78. M. E. M. Moore, ‘The Myth of Objectivity in Public Education: Toward the Intersubjective teaching of Religion, Religious Education, 1995, 90, 2, 207-225. 79. J. L. Elias, ‘Evaluation and the Future of Religious Education’, Religious Education, 1979, 74, 6, 656-667. 80. R. Homan, ‘Constructing Religion’, in L. P. Barnes (ed. ), Debates in Religious Education (Abingdon: Routledge, 2012), pp. 183-193. 81. E. Wright and A. Wright, ‘Thinking Skills’, in L. P. Barnes (ed. ), Debates in Religious Education (Abingdon: Routledge, 2012), pp. 223-234. 82. R. Freathy and S. Parker, ‘The Necessity of Historical Inquiry in Educational Research: the Case of Religious Education’, British Journal of Religious Education, 2010, 32, 3, 229-243. 83. P. L. Glanzer, ‘Finding the Gods in Public School: A Christian Deconstruction of Character Education’, Journal of Education and Christian Belief, 2000, 4, 2, 115-130.